I Loved This 30 Years Ago And I Love It Even More, Now! Quite a few years ago – decades, actually (I had to be honest there, even though it seems like yesterday) my grandfather used to cook this lovely dish that was one of my absolute favorites. My grandparents had a small farm, a 3-hour drive from our home, and they grew all of their own veggies, including potatoes. Needless to say, we ate a lot of potatoes whenever we visited them! But I never grew tired of potato dishes – I think it’s because grandpa loved them and he was always trying out different ways to cook potatoes. He didn’t cook every day – only on Sundays, but I think that made it even more special. He knew how to turn the simplest of ingredients into these dinner masterpieces that I am now desperately trying to copy. This dish was something that certainly didn’t last long, and there was no hope of having leftovers the next day! Some people call this moussaka but we didn’t – to me moussaka has always been the Greek dish with eggplants and white sauce. This one we just simply called potato casserole, and that’s what it is. 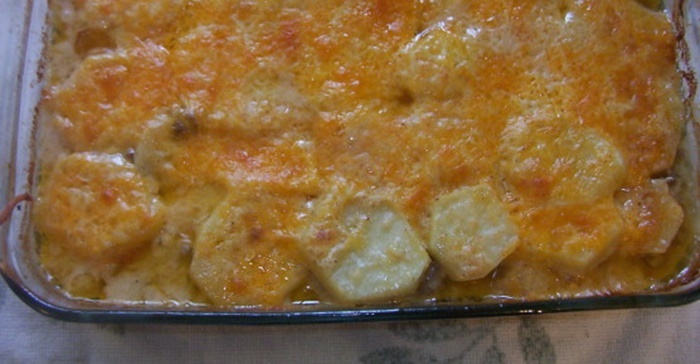 A simple, layered potato casserole – so delicious that you wish you could lick the casserole dish clean when it’s empty! Recipe and image courtesy of Genius Kitchen. Quick Tip: You could sprinkle some grated cheese on top, for the last few minutes of cooking.